An algorithm is step by step instructions to solve given problem. Lets take a simple example.You want to write an algorithm for listening particular song. 1) Search for song on computer. i.If Yes,Then listen that song. ii.If no,download that song and then listen that song. So we are solving a problem by step by step procedure.This step by step instructions is called Algorithm. Why do you need to evaluate an algorithm? You need to evaluate an algorithm so that you can find most optimize algorithm for solving given problem and also considering various factors and constraints. You want to go from city A to City B.Then there are various choices available i.e. by flight,bus or train.So you need to choose among different options depending on your budget and urgency. Number of instructions can be different for different programming languages. Lets count number of instruction for searching a element in a array. If element which we want to search is last element in sorted array then it will be worst case here. int n=array.length,i=0,return true or false will be executed one time. 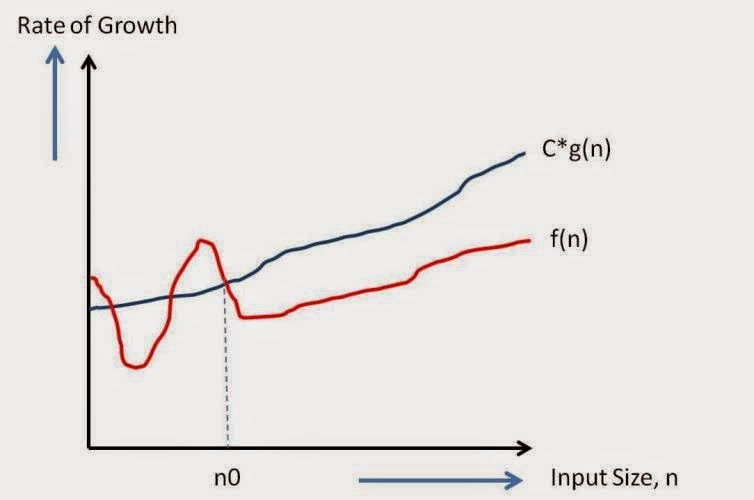 As n grows larger, we can ignore constant 3 as it will be always 3 irrespective of value of n. It makes sense as you can consider 3 as initialization constant and different language may take different time for initialization.So other function remains f(n)=3n. How will you compare algorithms? 4n+4 ——–>nSo here n is highest rate of growth. We are dropping all the terms which are growing slowly and keep one which grows fastest. This notation is used for theoretical measure of execution of an algorithm. It gives tight upper bound of a given function. Generally it is represented as f(n)=O(g(n)) and it reads as “f of n is big o of g of n”. 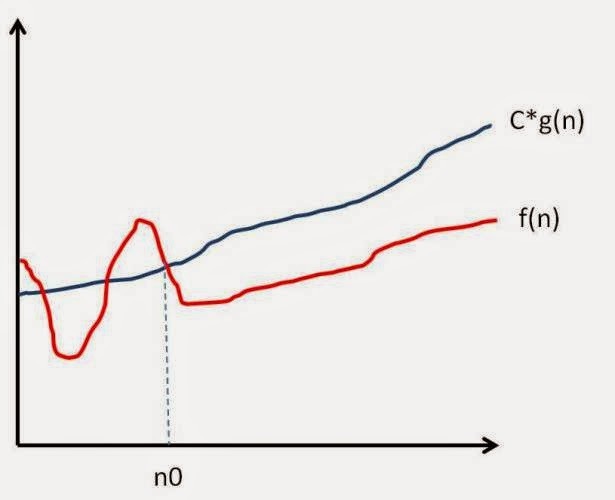 f(n) = O(g(n)) means there are positive constants c and n0, such that 0 ≤ f(n) ≤ cg(n) for all n ≥ n0. The values of c and n0 must not be depend on n.
When you say O(g(n)) , It means it will never be worst than g(n). Having said that it means O(g(n)) includes smaller or same order of growth as g(n). So O(n) includes O(n),O(logn) and O(1). So O(g(n)) is a good way to show complexity of algorithm. Lets take some example and calculate value for c and n0. 4n+3<=5n for n0=3 and c=5. so there can be multiple values for n0 and c for which f(n)<=c g(n) will get satisfied. Simple programs can be analyzed using counting number of loops or iterations. We need to add time complexity of consecutive statements. Time complexity of a loop can be determined by running time of statements inside loop multiplied by total number of iterations. It is product of iterations of each loop. When you have if and else statement, then time complexity is calculated with whichever of them is larger. Lets understand logarithmic complexity with the help of example.You might know about binary search.When you want to find a value in sorted array, we use binary search. first = mid + 1; // Repeat search in last half. 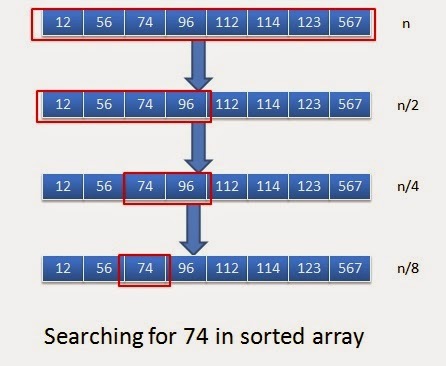 and we want to search for 74 in above array. Below diagram will explain how binary search will work here. When you observe closely, in each of the iteration you are cutting scope of array to the half. In every iteration, we are overriding value of first or last depending on soretedArray[mid]. It makes sense as in our example, we have n as 8 . It took 3 iterations(8->4->2->1) and 3 is log(8). So If we are dividing input size by k in each iteration,then its complexity will be O(logk(n)) that is log(n) base k.
Complexity of above code will be O(log(n)).